Aliens vs. 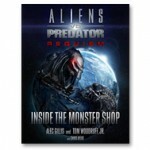 Predator: Requiem – Inside the Monster Shop is the upcoming sequel to 2004's Alien vs. Predator film. In this follow-up to the worldwide hit ALIEN VS. PREDATOR, the iconic monsters from two of the scariest film franchises ever, wage war in an American Midwestern town — with the residents caught in the middle. Filming began in September 2006 in Vancouver. Tom Woodruff, Jr. and Alec Gillis from Amalgamated Dynamics (ADI), veterans of the first AVP and all the previous ALIEN sequels, will be handling the creature FX for the encore film as they did for the previous installments. ADI opens its doors to unveil the secrets of the creature design process behind two of the most frightening characters ever! From conception to fabrication and finishing, follow their talented crew in-studio and on location through this captivating book. Categories: Books, sorry you missed us // out of print. Tags: Alec Gillis, Tom Woodruff.